Go Visit This Store by Selecting "Sign NDA" to the left. OWNER IS MOVING OUT OF COUNTRY AND SAYS BRING ME AN OFFER NOW!!!!! This full serve restaurant has not been opened since a complete remodel in both the front and back of the house. Avoid the hassles of permits and unexpected construction delays and costs and get up and running quickly with this turn-key, newly renovated and remodeled restaurant that would be great for Indian, Mexican, Mediterranean, Cajun, Breakfast lunch concept, Steak-house Italian-Pizza, Gastro-pub or any other concept. Corner location with good visibility on major thoroughfare offers easy access in this eclectic harbor community. Approximately 1100 sq feet with seating for 50. Dining room has polished concrete floors, solid dark wood chairs and tables, new exposed HVAC ducting and hanging light fixtures with Edison bulbs. 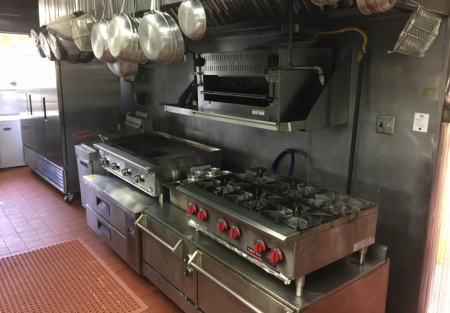 Line has new equipment including 6 burners, 2 ovens, 3' char-broiler, refrigerated equipment base, 2 basket fryer, cheese-melter, salamander. Other equipment includes ice machine, beverage reach-in, refrigerated prep table, steam table, microwave,freezer, 3 door reach-in, dishwasher. LOTS of small-wares including pots, saute pans, hotel pans, kitchen utensils, flatware, plates/dishes, glasses and more. Seller states new lease is possible with 5 year initial term and two 5 year options. Owner states that beer and wine posting is complete and only waiting approval from city council. Want to see this location? Go To SellingRestaurants.com and Search for Listing 5418. This is a Paramount Restaurant Brokers, Inc. listing. DISCLAIMER: The User (that's you reading this) of this Website understands that Paramount Restaurant Brokers, Inc. ("Broker") or its agent(s) do not audit or verify any above information given to or gathered by Broker or its agent(s) from Seller, our Client, or make any warranties or representations as to its accuracy or completeness of the information provided, nor in any way guarantee future business performance. The User should perform a complete and detailed due diligence on the business and or real estate before buying it in addition to seeking professional advice from an attorney as well as a CPA. In some cases, forward looking statements may have been made but these statements are absolutely no guarantees of future performance of the business as each User has differing skills sets to either grow the business or kill the business. Owning a business is a risky venture, but can also be a rewarding one. The User of this website is solely responsible to examine and investigate the Business and or real estate (if included in the sale), its assets, liabilities, financial statements, tax returns, and any other facts which might influence the User's purchase decision or the price the User is willing to pay. In most cases, the Broker represents the Seller who is our principal, but the Broker owes the User a duty of fair and honest dealings. Any decision by User to purchase the Business shall be based solely on User's own investigation and the User's legal, tax, and other advisors and not that of Broker or its agent(s). Any listing information may change at any time without any notice to User and User should often review the listing on the website to keep up to date.